In today’s world, certainly in the last 20 to 25 years the focus in selling has been on the “consultative sales approach” for closing more business. I don’t disagree with this this type of approach. It revolves around carrying on a dialogue with your prospects. The idea is to do more listening and less talking. Keep the customer conversing with you on what they need and then in theory…Wham o – the deal should just close itself. If done right then a skillful salesperson can probably get the deal to “just close.” After all the prospect spent the last few hours, days, month and/or years telling you exactly what they need and why your type of product will serve their needs. But for some reason, even with your product you didn’t get the deal or worse the prospect STILL has the same pain they had when you began the process. Prospects are people and people in general HATE making decisions. So to make it a little clearer, you may have the exact product that is needed but usually your competitor has a similar product as well. So which one of the two consultative sellers did the prospect buy from? The one who actually closed the deal! I am not abandoning the consultative sales approach. What I am saying is that a lot of salespeople are using it today. So if you get two salespeople with similar products, one of the two still has to close the prospect into a customer. Have you lost the “art of closing?” Here’s my favorite way to tell… One of the homework assignments I give in my Sales Training classes in Atlanta, GA is: Will you write down the two closing statements you used last week. You get some pretty interesting answers, but typically none of those answers are real closing statements. Learning to close could significantly increase your revenue next year. That’s quite a headline… “Immediate Positive Sales Results” One of the ways to achieve those positive results is through sales training. A lot of sales trainers are franchise holders of one of the many large sales training groups in America. These sales trainers purchase their material which is generated on a national basis – basically one size fits all approach. I have attended many of these, and as I have written before any training from a competent sales trainer is better than no training at all. However I have noted before that many times the representatives leave the training, practice what was taught for a couple of hours and then go back to what they were doing before. Then they start griping that the sales training was worthless. When I got into the sales training business in Atlanta, Georgia I wanted to make sure that I was training to the representatives needs. My approach is to interview everyone I can get my hands on. Spend several hours learning what is needed and then devise a sales training course to solve the representatives current problems. My sales training in Atlanta courses are designed to fix what is broken, and to fix it today! If you fix what is broken in your sales process you will succeed in closing more business. Focus your sales training like I do on what you can fix today to be more successful. Millions of women around the world use and sell Mary Kay cosmetic products. Most probably start out as users of the product. They like the quality, and how the products make them look and feel. The marriage begins. The first meeting is attended and the product training flows in at an enormous rate. One thing is clear about Mary Kay Independent Representatives – they know and use their products! After about 4 weeks of product training our new representative begins to venture out on her own. Sales come in but then, then something happens to her that was unexpected. For her and a sizable amount of these new salespeople their sales begin to drop off or become non-existent altogether. Quickly and finally the new sales reps just fade away from their independent businesses due to lack of sales. Mary Kay Directors are excellent at recruiting and product training. To keep these new independent representatives engage in the sales process they also have to teach how to sell the product. Sales is about the customer and what the customer is thinking at that moment, not the location of the next host party. Here is an article to support this exact point. http://atlantasalestraining.weebly.com/mary-kay-sales-training.html Directors spend so much time on recruiting and product training yet the turnover of representatives can be a daunting task to get under control. My advice set up some professional sales training. Or if you need more convenience attend an online or web based sales training so you can learn the fundamentals of sales and pass that along to your own recruits. Direct Marketing is a term that draws fear into those who are beginning their sales career. Everyone has heard of a disaster story. This MLM didn’t work or that Avon sales representative who just gave up. And when they give up, when the sales fail to materialize haven’t you noticed that it always the companies fault. They didn’t do this, or they didn’t do that. MLM’s, Mary Kay, Avon, Tupperware, Amway, you name it there are many, many Direct Marketing Firms that are solid companies that are worth joining. You can’t and I mean can’t take a person off the street and expect them to just start selling. Occasionally you will run into “just the right” person that through their own sheer will can get it done but most ordinary people joining Avon, Mary Kay or any Direct Marketing firm need some sales training help. 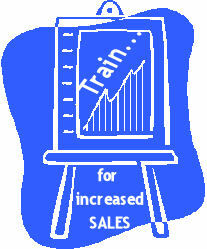 Probably the best method to get that type of direct marketing sales training is through e-Learning. I’m not opposed, in fact I would rather have these new, green salespeople in one of my 2-day sales seminars but I understand the expense and time that those types of classes demand. e-Learning is a method where the new Mary Kay representative or Avon associate can learn the basics of selling to the public. These new, green salespeople tend to fail when they run out of “friends and family” and have to start selling to the general public. e-Learning will teach them the basics AND will teach them that it is okay for someone not to want or need your product. However, e-Learning sales training will definitely teach the new direct marketing salesperson that if you stay on task and keep to the sales process you will succeed. The best part of e-Learning is that it is inexpensive and can be done in short 1 hour time frames! Good luck to all direct marketing salespeople including the newest Mary Kay or Avon representatives. Keep e-Learning sales training in mind – it can definitely help you succeed. It amazes me that a “salesperson” can work hard all week driving a prospect to a close and then never ask for the order. One of two things is happening when I recognize this situation. The sales representative actually thinks that they have asked for the order. The sales representative is afraid of asking for the order. When coaching sales reps after a call I focus a lot on their closing statements. I try to drill down to what the purpose of the call was and how does the rep think that the call went. I especially like to drill down on closing statements when the call appeared to be moving in a positive direction. If it sounds like their should have been a close to purchase then I will definitely turn my attention to that piece of the sales process. When dealing with situation #1 above I’ll replay the tape or just sit and discuss what happened on that particular call. The reps typically think that they did ask for the order. They all say the same thing… “Yes I did close the call, here’s exactly what I said.” About 15 sentences later they end up agreeing with me, there was no close. What they end up saying is that they beat around the bush but they did not use any one of a thousand different closing statements. Bottom line – they never asked for the business. When coaching on situation #2 above… “The sales rep is afraid to ask for the order” I have to go a little deeper into the psychology of the sale with the salesperson. Here the sales rep is really afraid of losing the order. In their mind the best way to lose an order is to ask for the sale. They believe that since the conversation is going so well with the prospect it is just a matter of time before that prospect asks to buy the product from them. Don’t laugh, I you are a sales rep then you have probably in your career done both #1 and #2 above. I have listened to too many phone calls to believe this is not happening. My mission statement says that I will provide “…immediate positive sales results…” How do I know that? Because when I am conducting an Atlanta Sales Training class I focus on the things sales reps need to do and I know that one of the things they are not doing well is closing. When you email, mail, drop off or hand your prospect your contract that contract will not magically start talking to the prospect. The person handing the contract to the prospect has to close the sale by asking for the business or the contract remains another pile of paper on the prospect’s desk. Don’t forget to ask for the order! Just that one sentence… Asking for the order will provide immediate positive sales results. Add to that all the other things that are actually in the sales process and you can see why sales reps need sales training.